Everybody would like to get free log home plans – maybe just to browse and dream or maybe to actually use the plans to build a log home. But you must be careful: every plan is copyrighted, even if the designer hasn’t gone through the actual copyright process. If you think you can get free log home plans simply by using someone else’s plan you can be in breach of copyright law. And it’s not enough to simply change a few things on an existing plan and call it your own. Designers and architects put many hours of their time into these designs and plans and have carefully worked out layouts, room sizes, mechanical chases, window placement, stairway runs, plumbing, roof loads and cabinet sizes to provide the optimum use of the space. Most log home kit companies provide plans and design services if you’re buying from them, and most log home builders have plans that they will build from and if you contract with them they will provide free log home plans. Likewise, log home builders generally have several models of cabins that they build or have built, and these can be altered or tweaked to suit your situation. The best approach is to begin with a site visit and design a cabin customized for your topography, views and drainage. So use the plans you find online and in magazines to fuel your planning and dreaming but don’t simply copy plans to use for your build without contacting the author for consent. An excellent book for log home inspiration is "Cabin Fever" by Rachel Carley. You can find other suggested reading at our Virtual Library page. Most log home companies can work with your sketches and drawings, even if they’re on a napkin. There are free cabin plans available on-line, primarily for small log homes, camp cabins and backyard structures. Maybe you want to build a hunting cabin or a modest guest cabin for people to stay in. A writers retreat or an artists studio in the woods would also be good uses for these free cabin plans. Our free small cabin plans page has several simple plans that are in the public domain and are available to download and print. It's great to find plans that are downloadable so you can start planning and building your cabin immediately. You can find several other downloadable free cabin plans from Log Cabin Hub here. "Each of our house plan packages comes with: full construction documents or blueprints (including construction details which incorporate proper building science techniques), a home energy model for the city and state combination in which their home building project will occur, a LEED checklist, and coming a soon, NAHB Green Building Standard Checklists, and the Energy Star Designed to Earn Credit. Finally, each of our house plans come with a cost estimate for your local area so that our users can see how much it will cost to build one of our green house plans." One of the best things you can do to prepare is to assemble an idea book. Use whatever you can think of to try and capture the feeling, size and layout of your cabin floorplan design. 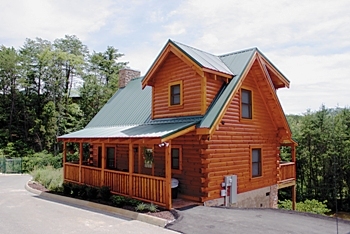 Check out our page on log home plans for 1-BR, 2-BR, 3-BR and 4-BR cabins. Once all of your parameters are factored in it’s much easier for a log home company or log home designer/builder to come up with a design to accommodate most if not all of your wish list. Are Free Log Cabin Plans Available?